Â Â Â The UST Graduate School held the July, September, December 2013, and January 2014 editions of its Legatum Lecture Series amid much excitement. Â Â Â The first forum was held in July 2013 with the lecture presentation of Rev. Fr. Isidro AbaÃ±o, OP, Director of the UST Museum and the former Program Coordinator for Cultural Heritage Studies. Â Â Â In September, three fora were organized, the first of which was the lecture by Dr. Rolando Tolentino, Dean of the UP College of Mass Communications, who delivered a talk on Panitikan at Batas Militar. The event, spearheaded by the Literature and Creative Writing cluster of the UST Graduate School, coincided with the Proclamation of Martial Law on September 21. Â Â Â The second forum was a round-table discussion on the controversial issue of pork barrel, or the Priority Development Assistance Fund (PDAF), hosted by a PhD class attending the course Philosophy of St. Thomas Aquinas handled by the Regent of the Graduate School, Rev. Fr. Jose Antonio E. Aureada, OP. Different perspectives on the said issue were tackled from the point of view of religion, political science, economics, and public administration.Â The guest speakers were Rev. Fr. Rolando dela Rosa, former Rector of the University of Santo Tomas, Atty. Gener Gito and Atty. Gideon Mortel of the Philippine Senate, Professor Tommy Tiu of the business sector, Mr. Julius Lopez Porley and Mr. Xander Kim Sigua both representing the Public Administration sector. Â Â Â The third forum was a symposium on Inter-Mirifica sponsored by the Social Pastoral Communication discipline held at the Martyrs Hall of the Ecclesiastical Faculties. Inter-Mirifica is a Vatican II document on social communication. Invited lecturers were Monsignor Paul Tighe, Secretary of the Pontifical Council for Social Communication, Fr. Anh Vu Ta of the UST Graduate School, Ms. Angela Blardony Ureta, formerly of ABS-CBN, and Mr. Christian Esguerra of Inquirer.net. Fr. Franz Eilers, SVD, who was also one of the lecturers, was the man behind the Graduate Schoolâ€™s Social Pastoral Communication program. Â Â Â On December 4, 2013, the Political Science and Public Administration cluster sponsored a forum on National Security Administration held at the Tanghalang Teresita Quirino Hall.Â The guest speakers included retired Brigadier General Fermin De Leon, Rev. Fr. Joseph Lazar, Mr. Mike Melchor and Ms. Amparo Fabre. Also joining the team of resource speakers were Dr. Ernesto Gonzalez and Dr. Edwin Martin of the UST Graduate Schoolâ€™s Political Science and Public Administration cluster. The resource speakers related how the threat from typhoon Haiyan/Yolanda as regards national security was handled by the military and civilian establishments. Â Â Â The last lecture was delivered by Professor Salvador Alegret, Professor Emeritus of the Universitat Autonoma de Barcelona whose lecture focused on Bioanalytical nanotechnology: An example of converging technologies.Â Professor Alegret is an honorary professor of the UST College of Science Chemistry Department. Â Â Â Dr. Marilu R. Madrunio (center), Dean of the Graduate School, with Rev. Fr. JoseÒ† Antonio E. Aureada, OP (left), Regent, and Rev. Fr. 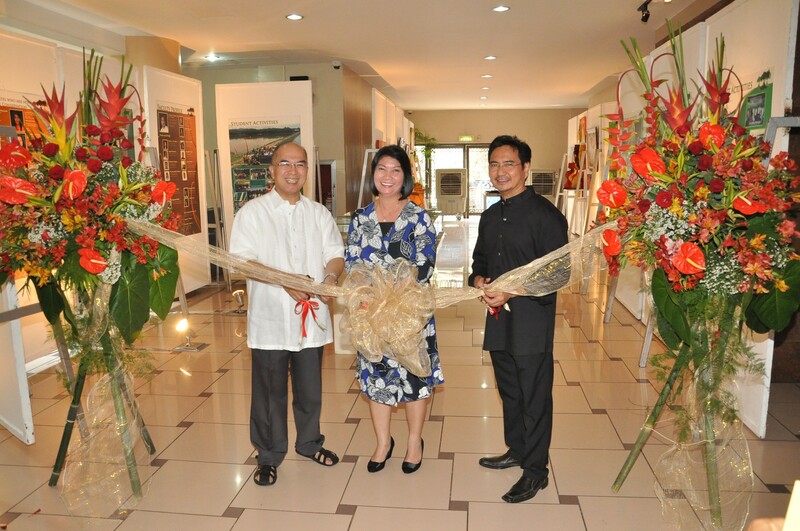 Isidro C. AbaÃ±o, OP (right), Director of the UST Museum at the ribbon cutting ceremony marking the opening of the Diamond Anniversary celebration of the Graduate School in July 2013.